Flightmare was developed to promote IconAir — an airport theme party held at IconMedialab Norway in October 2000. The aim of the game is to fly ten Internet consultants safely to a random Icon destination, keeping them happy and entertained the whole flight long. At the end of the journey each passenger lets you know what he thought of your efforts with a roll of the dice. Passengers are equipped with a simple form of artificial intelligence. They can tell you when they’re hungry, thirsty or need a pee. They may ask you for a newspaper or to take away their mealtray. Please them and they’ll reward you with a high score. Ignore them and they get very angry indeed. 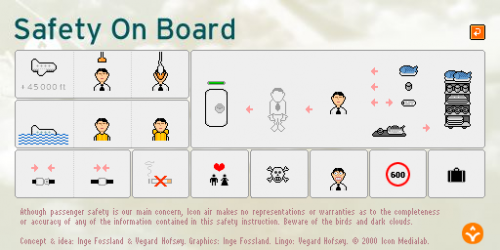 Safety on board: A Safety On Board screen also gives instructions on how to play the game. In air: Hitting dark clouds or birds will result in heavy turbulence. Passengers are not crazy about this. Avoid high altitudes as oxygen masks will pop out. Oxygen does not last forever and eventually your passengers will suffocate. Landing: At the end of the journey each passenger lets you know what he thought of your efforts with a roll of the dice. Crashing will probably kill most of your passengers. Survivors may still give you a score — but don’t count on a high one. 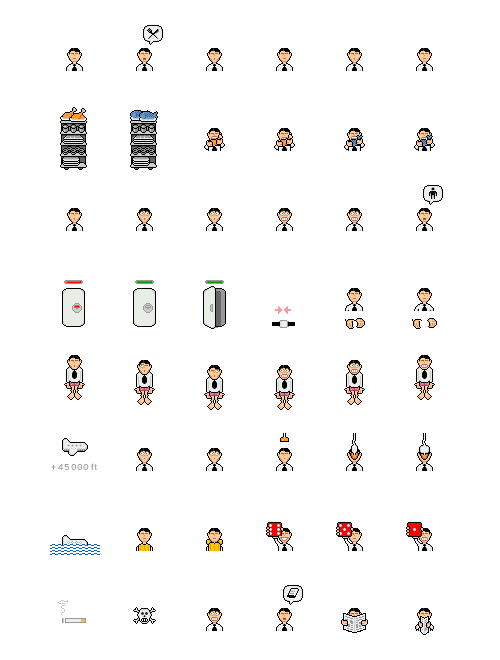 Sprites: Images of some of the sprites that went into the final game.